I am excited about this program. 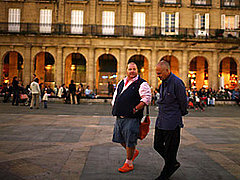 José Andrés kindled an interest in all things Spanish with his show, Made in Spain. I do have a love-hate relationship with holier-than-thou Gwyneth, but the love part of the love-hate thing compels me to watch her, even if she does say obnoxious things in the press and offers her opinion when no one was asking (that’s the hate part). Also, I want to see what she wears (the love part again). But she’s probably just doing this to show off her fluency in Spanish (hate her). It’s very complicated. Anywho, the first episode, Tilting Windmills in Castilla la Mancha, starts with Mark and Mario at Madrid’s fish market, while Gwynnie and Claudia “lounge luxuriously eating churros and hot chocolate.” (Hate, hate, hate.) Then Gwyneth and Mario drive to Toledo for a cooking lesson with one of Castilla la Mancha’s top chefs, while Mark and Claudia travel the route of Don Quijote, tilting at windmills and learning how to make Manchego cheese. Apparently Mario tries bird sushi, which doesn’t agree with him. Click the link to the episode for a short preview. It seems like squash takes over the farmer’s market this time of year, and we’ve been looking for ways to use it up. Enter zucchini bread. So not healthy, but I so don’t care. Have you tasted this stuff? It doesn’t taste much like squash, but it’s so sugary and moist. The edges are crisp and golden. Deelish. The recipe I used was from the Food Network, featured on Paula Deen’s show, Paula’s Home Cooking. I have not seen the show because we don’t have cable (gasp!) and just watch our PBS chefs. There are a lot of reasons we choose to not pay for 500 channels, mostly because of an incident in college when I found myself skipping class to watch an episode of E! True Hollywood Story about the TV show 90210. Sad, sad, sad. Anyway, I found this recipe through a Google search. Also, the recipe says to bake for one hour, but I found that it took one hour and 20 minutes. Set your timer for an hour, and if it’s not done when the timer beeps, retest every five minutes or so. Preheat oven to 350 degrees F. In a large bowl, combine flour, salt, nutmeg, baking soda, cinnamon and sugar. In a separate bowl, combine oil, eggs, water, zucchini and lemon juice. Mix wet ingredients into dry, add nuts, and gently fold in. Pour even amounts into two greased loaf pans, for one hour, or until a tester comes out clean. Alternately, bake in five mini loaf pans for about 45 minutes. Got your attention? It sure had ours when we watched Ming Tsai and Michael Chiarello create this masterpiece on Simply Ming last week. Honey and Balsamic Glazed Salmon Spirals with Sesame-Orange Spinach…sounds heavenly, no? The Sage and Rosemary Oven-Baked Potatoes are our own addition. Ming’s show is based on the idea of east meets west, and every week he pairs two core ingredients that are used in each dish. He also calls on another chef to create a recipe using the core ingredients, inviting viewers into the envious kitchens of famed chefs such as Michael Chiarello, who created this dish. The core ingredients for the salmon and spinach were balsamic vinegar and sesame oil. The best tips we learned on the program were not to overdo it on the sesame oil (a little goes a long way) and that salmon need not be served piping hot. It’s better to let it rest to really let the flavors meld together. Preheat oven to 400 degrees. Wash, rinse, and stem the spinach. Heat the 2 tablespoons olive oil in a large 14-inch sauté pan over high heat. When hot and just beginning to smoke, add the sliced garlic and cook until golden brown, then add the orange zest and spinach. Cook the spinach, tossing frequently until fully wilted and tender. Remove from the heat, drizzle in the sesame oil, and check for seasoning. Divide the spinach, and quickly wipe out the pan with a paper towel. Spread about 1/3 of the total spinach on a plate. Cover the remaining 2/3 spinach with foil and reserve warm. In a small bowl, mix together the honey and balsamic vinegar. Using a sharp knife cut the salmon into 4 lengthwise strips (from collar to tail). Lay the strips of salmon out flat and season on all sides with salt, pepper, and the mustard powder. Line the top of each salmon strip with equal amounts of the plated spinach. Start from one end and roll the salmon up into a spiral, secure each with two wooden skewers. Place the sesame seed mixture onto a plate, and dip each side of the salmon spirals into the seeds. Heat 1 tablespoon olive oil in the 14-inch pan that was wiped out after the spinach. When hot, but not quite smoking, add the salmon spirals and brown for about 2 minutes. Turn the salmon over and allow to brown for about 1 minute on the other side. Brush about 1-2 tablespoons of the honey/balsamic mixture over the salmon and place in the oven for about 6-7 minutes. Remove the salmon from the oven and brush again with the honey/balsamic. Arrange the reserved, warm spinach on a large platter or each of 4 plates. Remove the skewers from the salmon and place on top of the warm spinach, spoon a bit more of the honey balsamic over the salmon, and drizzle little more sesame oil over the top. This is a very relaxed recipe we threw together after smelling the sage from our garden. Modify to suit your tastes. In a pestle and mortar, mash together the herbs, lemon juice, and a good glug of olive oil. Brush potato wedges with the mixture, and place wedges on a greased baking sheet. Bake for 20 minutes. Remove from oven, and turn wedges; cook for 10 to 15 minutes, or until tender inside and oh-so-crispy on the outside. Some that we’ve made have been too mushy. Others have been too hard. These muffins are just right. They’re a bit of a mash-up of a couple of recipes, with a twist. We left out raisins because Luis and I each have specific ideas about when and how raisins should appear in food. I won’t go into that here; it’ll just sound neurotic. Anyway, we substituted dried cranberries, and since orange goes so well with cranberry, we threw in some zest and juice from an orange. Flavorful, great texture, and full of fiber…couldn’t ask for more from a muffin. Preheat oven to 350 degrees, and oil the muffin tins. Zest and then juice the orange. In a large bowl or stand mixer, mix together the bran, flour, baking soda, and baking powder. Add the sugar, honey, oil, water, vinegar, zest, orange juice, and cranberries. Stir together (or blend) until just mixed. Spoon into muffin tins, and bake for 35 to 45 minutes, testing with a fork or skewer to see if they’re done. Let cool (the hardest part!). Hello, Kumquats! I’m feeling quite zen at the moment, and while it could be the great yoga session during lunch, I think it has more to do with a satisfying evening in the kitchen. When my head is a mess or when I need to zone out, I like to cook freestyle. It’s not about half a teaspoon of this or a pint of that; it’s just about getting in there and getting dirty. Improvising. Carpe-ing the diem. Tonight I made Tomato and Zucchini Gratin, guided by MattBites, who not only posts great recipes, but also takes lively, colorful photographs. His directions included no measurements; this was strictly interpretive cooking. Matt encourages cooks to add a little of this and a little of that. “Trust me…it’ll be okay,” he writes. It’s easy enough to make; the only glitch was a common problem I have with herbs, which has nothing to do with the cooking directions, or with the herbs, for that matter. My daily routine is to come home, workout, shower, get into pjs, and then head into the kitchen. The problem is that as I start to gather ingredients, I realize that I need fresh herbs from the garden. Usually I can convince Luis to go, but today he’s working late. And I’m in my bright yellow pajama pants covered with orange and pink monkeys. What to do? I rummaged through my closet looking for some protection from the no-seeums that lurk in tall grasses. Now, I realize that I could have put on a respectable pair of jeans and some trainers, but instead I chose the equestrian riding boots. Yes, I tucked my monkey pants into my knee-high boots, and set out for the herb garden. Thank goodness we live in the country. We also had several carrots and a sweet potato we needed to eat before I went to the farmer’s market on Saturday. After Googling a recipe that included those ingredients, I came across the Original Moosewood Carrot Soup Recipe, posted last year by Slashfood. I can’t say enough about this recipe. Creamy, hearty, and flexible. Adjust it to your tastes, or to what you have in the fridge (as we did). Finally, there was an article I came across this weekend called Unhappy Meals, written by Michael Pollan, the author of In Defense of Food and The Omnivore’s Dilemma, both of which are on my reading list. Unhappy Meals, published last year in The New York Times, discusses how the food industry, nutritional science, and journalism have created the widespread confusion surrounding what humans should eat. Our confusion is evident with each new diet fad, touted by the celeb-of-the-minute, claiming to have unlocked some mysterious, magical secret. Eat low fat (avocado gets the ax). Don’t eat carbs (goodbye, fruit and whole wheat). Consume products fortified with omega-3s (and what of omega-6?). Pollan’s food mantra is simple: “Eat food. Not too much. Mostly plants.” In practice, you’ll find it more difficult since Twinkies aren’t food, according to Pollan’s definition. But not to worry, the last part of the article gives you nine rules of thumb to point you in the right direction. Pollan also claims something I’ve always suspected (without proof or research of any kind on my own, mind you): It’s more effective to eat foods with vitamins already in them, than to take supplements created by extracting various nutrients and mashing them together into a pill. According to Pollan, recent studies show that the vitamin supplements are worthless. It’s a long article, but well-worth the time. I did something so stupid last night that the whole boot of Italy is kicking me in the arse right now. Italian nonnas would scream in terror and cover their grandchildren’s eyes at the sight of it. All I can say in my defense is that hunger clouded my judgement and made me do the unthinkable. All day yesterday visions of spinach lasagna danced in my head. After my post-workout shower, I preheated the oven and put a pot of water on to boil. The cookbook I was following had two recipes for marinara sauce. One was fairly traditional, the other “quick and easy.” I was skeptical of the latter, but the rumbling in my tummy was louder than the little voice warning me that this was a very bad idea. The problem with the recipe was that it instructed one to throw all of the ingredients, raw, into a blender. This included 1/2 an onion and two cloves of garlic per cup of sauce. I cut down the amount of onion and garlic to less than half and threw in the tomatoes, oregano, basil, salt, and pepper. After giving it several whirls, I took off the lid and had a taste. Oh. Dear. Lord. It was like eating bright orange onion juice. This was some seriously offensive sauce. The sauce was wrecked, there was odious orange gunk everywhere, and I was too annoyed to bother starting again. I also was out of tomatoes. The oven, still warming up in anticipation of spinach lasagna, was turned off. Game over. Spinach lasagna will have to wait for another day, a day on which I’ll make marinara the right way…starting with the happy smell of sautéing onion and garlic. Some things are worth the wait.